Wolf Commercial Real Estate, a premier Southern New Jersey commercial real estate brokerage firm with expertise in South Jersey commercial real estate listings and services, now is offering 11 acres of prime South Jersey land for sale at 315 West Bridge Street Westampton NJ. Conveniently located within one mile of I-295, this South Jersey land site for sale offers easy access to the New Jersey Turnpike. This Westampton land for sale features a complex of four buildings formerly used for a school which gives this Southern New Jersey land for sale a campus-like atmosphere. This land for sale in Westampton also is adjacent to the Westampton Sports Complex. There is approximately 28,190 square feet of space in the four buildings at this South Jersey land site for sale at 315 West Bridge Street Westampton NJ. This land for sale in South Jersey is neighboring to many residential communities. The asking sale price for this land for sale in Westampton is $2,450,000. This South Jersey land for sale is available for immediate possession through Wolf Commercial Real Estate, a Southern New Jersey commercial real estate broker that specializes in South Jersey commercial real estate listings and services. The Southern New Jersey land for sale at 315 West Bridge Street Westampton NJ is situated within one mile of the Westampton municipal building and the layout of this Westampton land for sale allows for possible expansion. The main building on this land for sale in South Jersey has six classrooms, two teacher’s offices and one conference room. There’s also a break room library and open workshop area in the main building at this South Jersey land site for sale are 14 feet. There’s also a full-size basketball court with boys and girl’s restrooms adjacent to a café in the main building of this land for sale in Westampton at 315 West Bridge Street Westampton NJ. 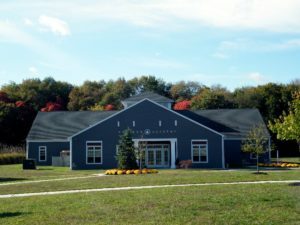 Two side buildings with three to four large classrooms, rest rooms and break rooms also are on this Southern New Jersey land for sale through Wolf Commercial Real Estate, a Southern New Jersey commercial real estate brokerage firm with expertise in South Jersey commercial real estate listings and services. Nearly 144,400 residents live within a five-mile radius of this Westampton land for sale. The average household income within the same area near this land for sale in South Jersey is $53,341. For more information about this South Jersey land for sale at 315 West Bridge Street Westampton NJ or about any other South Jersey commercial properties for sale or lease, please contact Christopher Henderson (856-857-6337; chris.henderson@wolfcre.com), or Jason Wolf (856-857-6301; jason.wolf@wolfcre.com) at Wolf Commercial Real Estate, a Southern New Jersey commercial real estate broker. Wolf Commercial Real Estate is a leading Southern New Jersey commercial real estate broker that provides a full range of Southern New Jersey commercial real estate listings and services, marketing commercial offices, medical properties, industrial properties, land properties, retail buildings and other South Jersey commercial properties for buyers, tenants, investors and sellers. Please visit our websites for a full listing of South Jersey commercial properties for lease or sale through the team at our Southern New Jersey commercial real estate brokerage firm.